No, really, tell me how to feel about it, because when I laid eyes on it, I stopped feeling anything at all. I don’t know up from down anymore, right from left. Good from bad. So, let’s back up to what we do know. 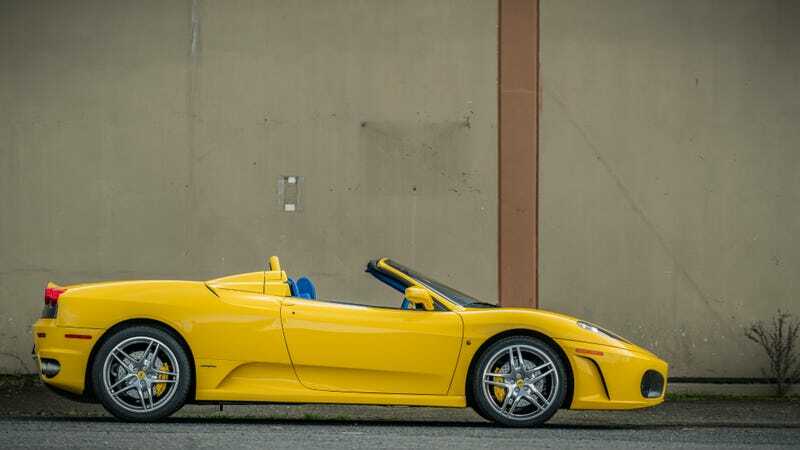 We do know that this is a 2006 Ferrari F430 Spider. A fine car. And still fine even with that coat of yellow paint! Too many Ferraris are red. We really should be painting them other colors. The car only has 2,592 miles on the clock, according to Avant-Garde Collection, where it is listed for sale. You have to call them for the price, though. And then we get inside and uh. Hm. Er. It’s yellow? Also? And blue? As well? I mean, if you graduated from the University of Michigan or if you’re Ukrainian, I guess I’d sort of get it, but as an interior just to have? Bold, to say the least. I will say that I do like the blue leather! Go big or go home and all that. But against yellow? I’m so torn. And here’s another question: How would you feel about it if the car wasn’t yellow? What if the car was red? Is there such thing as too many colors? What are you thoughts? Scream them in the comments, please.